STM Catholic is, above all else, devoted to the religious formation and spiritual well-being of our students. For this purpose, we provide instruction in the Catholic faith through required religion courses at every grade level. We promote active involvement in the liturgical, spiritual and sacramental life of the parish, but perhaps most importantly, we make evident the ideals of our Catholic faith through the daily life examples of our administrators, faculty, and staff. At STM Catholic, each day begins with shared prayer, read over the intercom by students in grades 1-8, or on special occasions, by a staff member. In addition to this, prayers are recited by students before and after lunch and at the end of the day. Prayer may be offered at any time during the school day; prayer at STM Catholic is not limited to religion class. Students recite formal prayers appropriate to their age/grade level and spontaneously make petitions for intentions they hold dear. In saying the Pledge of Allegiance, we boldly proclaim that our nation is one nation, under God. The school community will participate in forty(40) Masses this school year, with the first Mass and last Mass of the school year being led by faculty and staff, and all others led by students in grades 1-8. Students serve as readers, offertory gift bearers, altar servers, and choir members. Students regularly visit the Adoration Chapel, and they also participate in the Rosary and Stations of the Cross. Student altar servers in grades 5-8 serve at a daily parish Mass and at funerals scheduled during the school day. STM Catholic offers our students an opportunity to attend confession as a school during Advent and Lent. Confession is available through at regularly scheduled times through St. Thomas More Catholic Parish. The adoration chapel at St Thomas More is open 24 hours a day, 7 days a week and is available to students and STM Catholic families. Teachers frequently take students to the adoration chapel during the school day to pray and refocus. Students provide altar assistance to St. Thomas More Parish by serving daily and funeral masses. Eight graders enjoy a spiritual, team-building overnight retreat led by their middle school teachers. They also attend the Archdiocesan Chastity Rally. Seventh graders experience their one-day retreat on campus. Their retreat focuses on how their actions can make a difference in other people’s lives and what they can do to help others and leave a footprint of themselves behind. Sixth grade students attend Outdoor Lab for two nights and three days in the mountains. 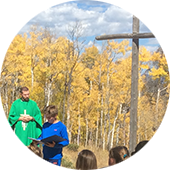 Hosted by John Paul II Adventure Institute staff, students have the opportunity to grow their faith and science knowledge through team building, scientific investigation, hiking, Mass, Adoration, confession and campfire activities. They also participate in the Archdiocesan-sponsored FOCUS 11. Fifth graders make an annual retreat to the Mother Cabrini Shrine and enjoy Mass with the Archbishop at the Cathedral of the Immaculate Conception in downtown Denver. The students and faculty of STM Catholic join together in saying the Rosary as a sign of unity and faith. One student in each class are selected, by the faculty and staff, each trimester and awarded the STM Peacemaker Award. A Peacemaker exemplifies the “Golden Rule,” is a collaborative worker and is a responsible citizen. Two members (one boy/one girl) of the graduating class are selected to receive the overall Peacemaker Award. Throughout the school year, STM Catholic children are actively involved in an established program that recognizes and shows appreciation for our clergy. At the school, each class has “adopted” one or more clergy/religious from a list provided by the church Office of Stewardship and Communications. With this “adoption”, students pray for their adopted ones and send them cards or letters to recognize birthdays and dates of ordination/vows and to honor them during Catholic Schools Week. Some students invite their adopted one(s) to visit their classroom or to attend their class’s Mass.